I don’t think I am immune to the beauty that surrounds me here in England, but after living here for 20 months, I must admit I have started to take some of it for granted. The neat hedges, the fluffy sheep dotting green fields, the storybook stone cottages with their thatched roofs, wisteria climbing up walls and dripping over doorways–I’m so accustomed to seeing these things that I don’t always stop now to appreciate them for their individual merits. These characterful features of the country’s landscape were once the primary focus of my photographs, but now they are more often in the background of candid portraits and architectural close-ups. Fortunately, a very dear friend (ともだち tomodachi) has just arrived from Japan for a visit. Having moved here from Japan myself, I understand how different the land, the vegetation, the roads, and the houses look to her. In fact, she is so in awe that, as we’ve been driving around the past two days, she keeps saying, “It looks so fake!” It took me a moment to understand she doesn’t mean that in a negative way…she only means that everything looks so perfect, like it’s been designed for a movie set (she even said this yesterday in the howling wind and sideways rain). 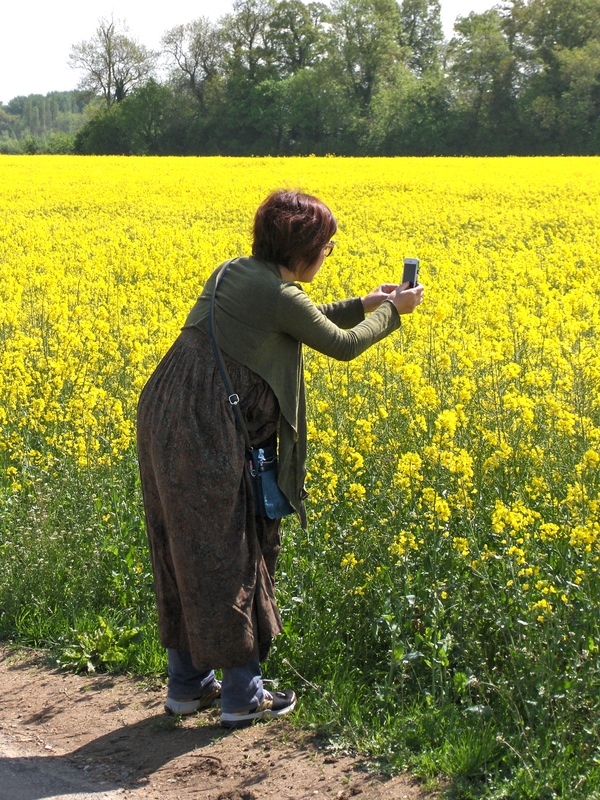 Or, more accurately, in her words, “It looks like Disney!” So today we tuned out the siren song of the outlet mall long enough to pull off on the side of a single-track road bisecting a field of rapeseed flowers, gilded and glowing under a brilliant sun. Witnessing her utter joy as she snapped away with her iPhone, storing images to share with her friends and family when she returns to her home halfway around the world, I was reminded not to take England’s natural beauty for granted. With but three short months left to enjoy it, I should be pulling off the road to capture my own memories every chance I get. Because, frankly, I don’t think even Disney could recreate this magic. W is for Welcome to Washington (Gwendolyn Rose: Living with a Corgi Princess) another new blog! So glad you have this opportunity with your friend! Also to enjoy the beauty of England a little while longer. Wish I could visit before you leave! You’ve still got two months (if you don’t mind an air mattress…the guest bed is up for sale!) so book a ticket!!! Thanks so much for the visit to my blog and the mention here. I am doing the Road Trip, too. I like the idea of posting three links each day. I am just started to do this now. I have enjoyed your blogs-to-visit suggestions. I would love to run and romp in that field of yellow flowers. Beautiful! It took great discipline not to walk out into the middle of that farmer’s field and lie down!